At Wolfman we are passionate about motorcycles. We love to ride, and we use our passion to focus on what we do for a living. We manufacture only the highest quality motorcycle luggage and we do it right here in the U.S.A. Why? We like to think we've helped create a small community of the people we work with to bring this luggage to you. In 20 years of business, we've watched the children of our employees grow up and move into their own lives, even as our own children have grown. 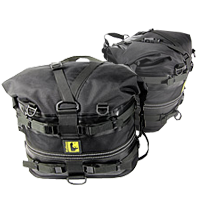 We offer one of the most comprehensive motorcycle luggage and accessory product lines in the business. We specialize in Adventure Travel luggage. Whether you are traveling around the world, or around the block we can carry your load. Our Expedition Dry Series will keep your contents dry, organized and solidly mounted to your bike. Riding an Enduro Bike? Our Enduro Series will carry all your needs to where you are going with no racks needed. We call this Enduro Touring. If your travels are on a bigger Adventure bike, we have Side Racks that mount our incredibly popular Expedition Dry Saddle bags, and rear top racks for our Expedition Dry Duffels. Check us out at our informative website at wolfmanluggage.com. We have videos and instructions online as well. Also we have full replacement parts on the site. Lost a buckle? We have it. We have sponsored many riders and racers over the years. We have had bags go around the entire world. The most current has been Ned Suesse in the 2012 Dakar and Chris Vestal in the Mexican 1000. My name is Eric R Hougen and I am the owner of Wolfman. I am passionate about motorcycles, designing and manufacturing motorcycle luggage. I have been riding motorcycles for over 35 years and my first bike was a Honda Z50. I also have a degree in Apparel Production which I use every day in manufacturing and designing Wolfman Luggage. For the past 20 years, Wolfman Luggage has been proudly made in the USA. For the past 10 years we have been highly focused on making product for the adventure motorcycle market. At Wolfman we are dedicated to manufacturing high quality functional luggage. We display this by using the highest quality raw materials we can find, the highest quality assemblers we can find, and we inspect every bag before it leaves our facility. We have had many of our different lines of luggage go around the world, some as many as four times! When someone buys a Wolfman product the reputation and quality is unquestioned. We like to say "don't worry about your luggage, just enjoy your ride."